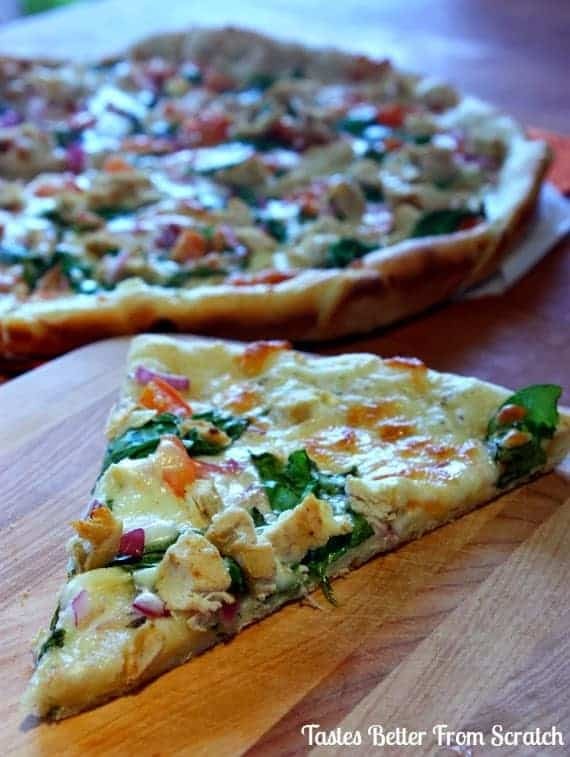 White Garlic Chicken & Veggie Pizza is made with a homemade pizza crust topped with a white garlic sauce, mixed vegetables and chicken. 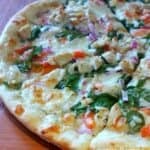 When ordering out, one of my favorite pizza’s is Papa Murphy’s take & bake Veggie Delight pizza. 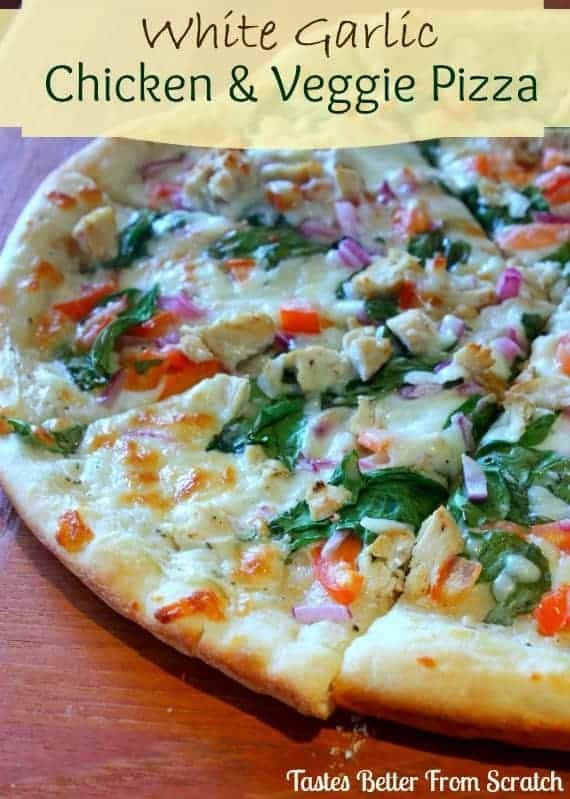 It has a white garlic sauce and it’s loaded with tons of yummy veggies! Since we love homemade pizza so much at our house we make a copycat version of this pizza all the time. Jeff loves when I add some grilled chicken, but other than that, this recipe is basically the same as the Veggie delight. It’s loaded with spinach, tomato, artichoke hearts, mushrooms and mozzarella cheese, and it’s to die for! I’m especially obsessed with the white garlic sauce, which is hard not to eat plain, with a spoon! After 5 minutes in the oven, remove the crust. Spread crust with an even, smooth layer of white garlic sauce. Sprinkle with cheese, chicken, and vegetables. Oh my gosh!! I WANT this now!!! It looks amazing! Thanks for sharing. Hi Jen, sorry for the confusion. You can definitely freeze the sauce if it made too much. I’ll have to go in and adjust the ingredients–thanks for letting me know. And you can bake it at 450 or 475 degrees F, depending on how hot your oven is! Either will work out great! Glad you liked the pizza! I love the Veggie Delight pizza too! Do you have a good pizza crust recipe? Can you use grated Parmesan cheese instead of shredded in the sauce? This is SO yummy! Thank you, thank you, thank you! Thanks so much Brenda! Happy you liked it! This pizza is fantastic! Probably the best I have ever made! The whole family loved it. Thanks so much for sharing! I love this recipe! It’s always a hit with my whole family!